. Knit So Simple: Welcome the Au Pair Project! Because i've declared 2011 as the Year of the Pair for my own personal journey, and decided that each month would produce a PAIR of projects . . and last week you meet Pearl who was modeling the 1st of 12 scarves . . it's now time to introduce the 2nd half of the Pair .... for each Adult project i complete, i'm trying to find a fun and tiny twist on things for the littles one so . 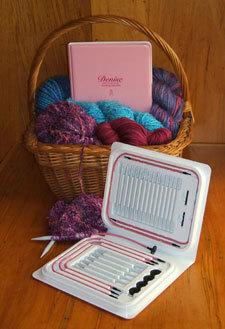 . . i've come up with the Au Pair Project as the compliment to the String of Purls! (just click on the tab above) I had so much fun knitting all the little hats i made before Christmas and hope that before i'm 70 i might have some little ones of my own to knit for! BUT why wait! Why not go ahead and start practicing and applying all the fun tricks and yarn ... to all the sweet little babies that need a warm and fun hat, booties, bibs, blankets and toys! My first attempt at hat pattern writing has been a fun one! and while this is designed for a toddler head i certainly hope to make adjustments to the pattern to fit smaller people, and have already had a request for a LARGER adult version as well (minus the loopy part at the top . . . not sure that's such a good look for a college guy!) .... I'm still in the stash busting business so i pulled out a skein of Lion Brand Wool Ease Thick and Quick, my size 13 circular needles and started knitting! it went SO VERY QUICK!!! Now, back to the hat! 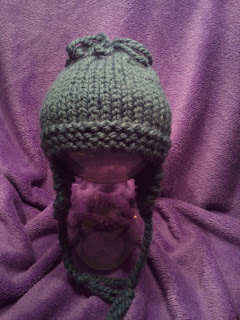 I'm calling it "Just a Little Loopy" because of the fun option of the Loops rather than a traditional pom pom on top. However, it's YOUR hat .. so knit away .. have fun with the option ... and get ready to add this little hat as a quick Go-To in your pack of prizes. I have talked w/ a friend who works with Save-a-Life here and she told me that they often do showers for the moms-to-be so i'm really thinking that this AuPair Project will make for a special gift basket for a new mom who is choosing to hold tight to the new creation within her! And perhaps there will come a time when i can sit down and maybe teach some of the new moms-to-be how to knit as well ... yet another way for them to be connected to this new and precious gift that they are carrying. As i was sitting and knitting and praying for these little heads that would one day wear these hats i couldn't help but wonder what God's thoughts were on our heads ... the Bible says He knows the very number of hairs on our head (including the gray ones!) and the verse that kept coming to the front was to Love the Lord your God with all your heart, soul AND mind! and then phil. 4:6-7 would chime in with His promise to guard my heart AND my mind .... so i saw a bit of a pattern here .. more PAIRing of things, so i did a bit of research on the phillipians passage. While verse 6 says "do not be anxious about anything, but in EVERYTHING, by Prayer and Petition, with thanksgiving, present your requests to God," verse 7 begins with the best word ever ... "AND" which points out for me that there are promises and results for me when i do what He has instructed. "AND the Peace of God, which transcends all understanding, will guard your hearts AND your minds in Christ Jesus." So, the next PAIRing question was heart vs mind. My Heart is the very CORE of my being ... it is THE very center of reality ... and when God looks at me He looks beyond what i may declare to others as far as who i am, and He sees me in all my weakness, in all my progress, in all my excuses and in all my utter poverty and STILL reaches down to redeem me! as i knit i pray .. and i can't think of a more precious gift for that new little one than to share a fun and loopy little hat that is filled with Prayers for Protection ... for their Salvation .. and for God's hand to forever guide their very tiny steps as they grow and live to serve Him.